Second XI is released on January 19th. 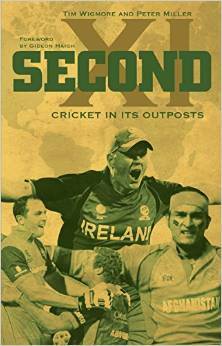 Other authors include Gideon Haigh, Sahil Dutta and Tim Brooks. Pre-orders are available. There will be a launch party at The Fentiman Arms in Oval on February 5 (@7pm to 9:30ish) where the authors will sheepishly sign copies. In retrospect, Australia didn't need so many runs. But nor did they need to win; nor did they need to give India a sniff; nor would they necessarily have prised out another four wickets with another dozen overs (a couple with the new ball notwithstanding). They would have won anyway, had they been capable of holding a catch. Statistically a set batsman scores around his average from any point in their innings. Ergo, dropping a catch adds their average to the total; dropping five adds about 200 runs; and that was the difference between winning and drawing. The difference between drawing and losing is largely in the opposition's hands. India began day five in a position to attack: take three quick wickets, spend all day chasing 300 odd. Marsh, whose 99 was more important than he'll probably get credit, was the only batsman standing between them and a gettable target. But India were flat. The fielding lacked intensity, the bowling wasn't being scored off, but nor did it look threatening. They left Harris and Marsh to work singles and wait. And Australia's batsmen were happy to do so. It was a disappointing way for a match to dribble out, but as noted in the preview, India are nothing if not patchy, particularly early in the day. Kohli's almost manic intensity will be a welcome change if he can lead his team to apply it constructively. The exception to this was Rahane, whose fieldng was so vigorous, and his desire to be involved, to talkk to his partner while batting, and to guide his team to a draw impressed in a way that the tv footage can't pick up. He batted almost as long in his second innings 48 as his first innings 147, and if his new captain has come of age on this tour, then his younger counterpart has shown he'll make a valuable lieutenant. Rain had the final say in this match, and there is not much to write about; only 17 wickets fell just over 200 overs of play. The one important thing was that Brathwaite and Samuels both scored tons for the West Indies, taking them ast the follow-on, and leaving no doubt as to the direction of the match. An upset in the final test could push South Africa off the top of the official test standings, but there seems little chance of that. The lack of depth in Sri Lanka's batting continues to haunt them, especially when Sangakarra fails. Karunaratne's 152 in the second innings threatened to create a threatening target, but with only Mathews pair of 50s in support, they ultimately just didn't have enough runs. On the other side of the ledger, McCullum continues his incredible year, this time peeling off 195 in 134 balls, while Boult and Southee have established themselves as one of the pre-eminent new-ball pairs with their movement and control. It took a big effort to back up after enforcing the follow-on, but a 300 run first innings lead is a lot to come back from. New Zealand are almost at the 1000 mark for the first time in more than a decade, and with a young team, they'll be fascinating to watch for a few years at least.